*BREAKING NEWS UPDATED* Royal Caribbean’s Anthem of the Seas encountered heavy seas and wind-gusts up to 74 mph this past Sunday. Waves resulted in upturned furniture and cosmetic damage about the ship. 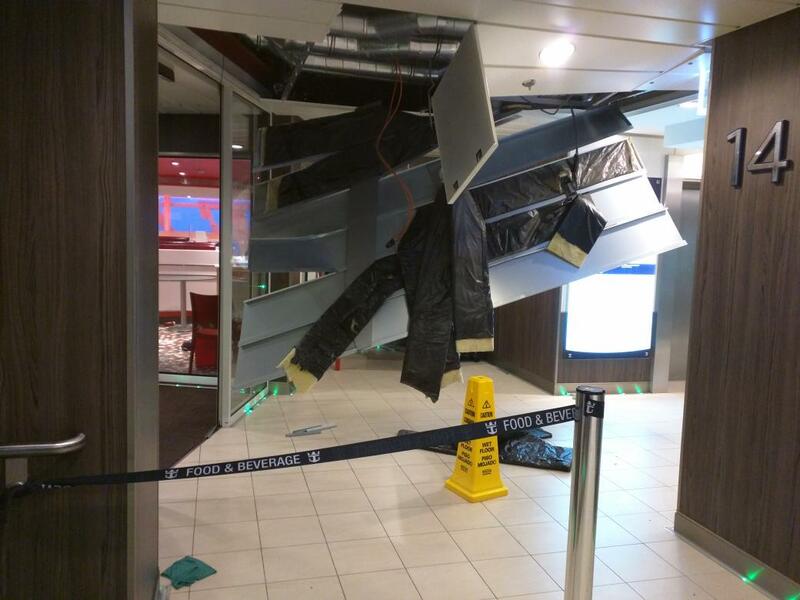 Passengers were restricted to their staterooms during the storm which did NOT interrupt viewing of the Superbowl. She has returning to Bayonne with the rest of the cruise now canceled. More details tongiht and on the Royal Caribbean Fan blog *Twitter Picture courtesy of @Flatgreg. Targeted for delivery in early 2016, Holland America Line laid the keel for a new “Pinnacle” class ship. Steel was put to block for the 2,650 passenger ship at Fincantier’s yard in Marghera, Italy. No name for the ship has yet been announced, however the interior design is being lead by Adam D. Tihany of New York and Bjorn Storbraaten of Oslo, Norway. United has set the date to retire their last 747s. Delta is close behind. It is not an exaggeration to say it is the end of an end of an era. The 747 was a monument to classic American aviation design and construction. The spacious frame allowed designers to gave rise to lasting changes in what was possible in passenger travel. the aircraft became an icon of popular culture and fiction. It became the flagship aircraft of a nation. Variations studied the stars and the atmosphere. One carried the first airborne laser weapon system. It's extended body carried whole fuselages of new airliners-some of which will ironically be why the type is retired. And the 747s status as a powerful cargo hauler is unmatched. At approximately 2:25 EST a passenger from an arriving flight from Canada emerged from a bathroom at the baggage claim area of Terminal 2. In his possession was a gun he had stowed in checked baggage. He shot and killed five as well as wounding nine others. He was taken into custody by Broward County Sheriffs shortly afterward. Fort Lauderdale airport is presently shut-down and passengers are being screened at various locations. Aircraft awaiting news on when the airport will reopen are being directed by the tower to contact a phone number but not given direction on if or when they can depart. Arrivals are being diverted back to their points of origination in some cases or to nearby airports. Departures of ships from Port Miami and Port Everglades were delayed. The Caribbean Princess and Nieuw Amsterdam were in-port at Port Everglades. The Enchantment of the Seas, Carnival Victory, Norwiegan Sky, MSC Divina, Navigator of the Seas and Insignia are docked at Port Miami. Enhanced security is in effect at both ports. A hotline for information about Friends & Family at #FLL is available: 866-435-9355 or 954-831-4000. For additional information: http://bit.ly/2hYJgey As of 8:45, passengers with personal automobiles were being allowed to leave the airport, passengers without were being bussed to Terminal 4 for pickup. As of Saturday evening Terminal 2 remained closed to operations but passengers were being channeled through other terminals. Anybody attempting to fly into our out of the airport was encouraged to arrive early and call ahead to their airlines. Near 10 p.m. the Caribbean Princess and Nieuw Amsterdam began their departures. As I begin this journey of writing this cruise blog, let me start by saying a cruise is totally what you make it. You can have an amazing time with action and adventure. Or you can have one of the most disruptive infringements upon your most precious time. Possibly ruin the trip you so deserve to take. There are many activities, excursions and sites to chose from. There is something for everyone of all ages to do. It's all up to you! Now imagine a blank canvas, where you are the artist. After you examine what colors you have to work with you begin the creation of your masterpiece. You get to tell an artistic view of what you see, hear, taste or smell. This is the way I would suggest that you pursue a cruise! The entire trip is your canvas and the hues you use, would be your adventures. Take for instance you decide to visit a few broadway shows let's paint a few strokes of yellow, then add a comedy show add some purple stokes. Next imagine all the free food available from all over the world 24 hours each day, that color could be green representing eat as many times as you like. Then you may decide to add karaoke or watch karaoke let's paint that red from the excitement. Of course if you want to just relax, absorb the sunshine and drift off into the beautiful sky's tranquility that color could be stokes of light blue. What if you just glazed at the depths of the sea full of dolphins or whales this could be dark blue. Or maybe you had a conversation or took a picture with the Captain add a few strokes of white. See how easy it would be to create a picture of beauty. That's just getting started. We have not mentioned swimming, hot tubs, zip lining, beaches, exotic beverages, water slides, the casino, dancing, movie nite, a few formal dinners, scuba diving, parasailing and more. Finally you take a few pictures to commemorate your trip, and your canvas is now complete. That's what cruising is all about creating beautiful memories full of vibrancy, laughter and adventures. It's all what you make it.